As a parent of a 8-year-old boy I find this story to be the most in creditable story of the YEAR. Because of this story I've added a new Hero Category for this blog. 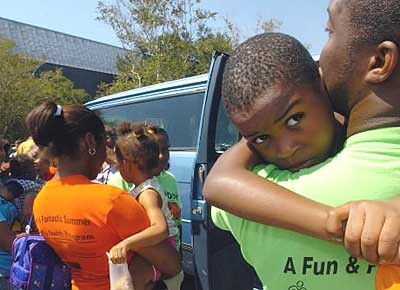 Deamonte Love, 6, right, clings to Big Buddy program volunteer Derrick Robertson outside a local shelter in Baton Rouge, La., on Sunday, while volunteers say goodbye to seven children who were separated from their parents during Hurricane Katrina rescues. BATON ROUGE, LA. - In the chaos that was Causeway Boulevard, this group of evacuees stood out: a 6-year-old boy walking down the road, holding a 5-month-old, surrounded by five toddlers who followed him around as if he were their leader. They were holding hands. Three of the children were about 2 years old, and one was wearing only diapers. A 3-year-old girl had her 14-month-old brother in tow. The 6-year-old spoke for all of them, and he said his name was Deamonte Love. After their rescue Thursday, paramedics in the Baton Rouge rescue operations headquarters tried to coax their names out of them. Transporting the children alone was "the hardest thing I've ever done in my life, knowing that their parents are either dead" or that they had been abandoned, said Pat Coveney, a Houston emergency medical technician who put them into the back of his ambulance and drove them out of New Orleans. Again, help the Red Cross help others. Give generously. Thanks!